On June 25, McGill, the University of Oxford and the Neuroscience Center Zurich (ZNZ) signed a tripartite partnership agreement designed to enhance collaborations in neuroscience investigation by developing new interdisciplinary interactions and creating synergies between researchers. From left to right: Jean-Marc Fritschy, Director, Neuroscience Center Zurich; Nick Rawlins, Pro-Vice-Chancellor for Development and External Affairs, Oxford; Christopher Kennard, Head, Nuffield Department of Clinical Neurosciences, Oxford; Heather Munroe-Blum, Principal and Vice-Chancellor, McGill; David Eidelman, Vice-Principal (Health Affairs) and Dean of Medicine, McGill; and Claudio Cuello, Chair, Brain@McGill at the June 25 signing of the tripartite agreement. / Photo: Owen Egan. When it comes to relationships, three is often seen as a number to avoid, as triangles have long been the catalyst for tragedy and heartbreak. But earlier this summer, McGill entered into a triangular relationship that promises to turn that old adage of three being a crowd on its head. In broad terms, the partnership will provide funding opportunities for collaborative projects; facilitate mobility of students and staff between the three institutions; and promote research initiatives bridging basic and clinical neuroscience, based on complementary expertise. While the tripartite partnership is new, McGill has been in separate partnerships with both institutions for several years now. The formal relationship with Oxford was established in 2009 and since then the two institutions have collaborated on more than 21 pilot projects ranging from the study of early childhood experiences and how they affect later health to the investigation of abnormal circadian sleep/wake patterns and the relationship with subjects who are at risk of developing psychotic disorders. Christopher Kennard, Head, Nuffield Department of Clinical Neurosciences, Oxford, said he is thrilled to expand the partnership to include ZNZ because, at day’s end, it will be the patients who benefit. 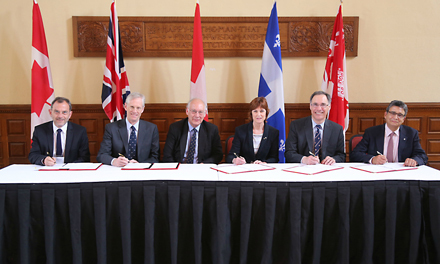 “This tripartite agreement offers the opportunity to bring together world-class neuroscientists at McGill, Oxford and Zurich in collaborative programs of research in both the basic and clinical neurosciences,” said Kennard. “This will provide an unprecedented opportunity to enhance human health, particularly in neurological and psychiatric disorders. McGill first entered into a partnership with ZNZ in 2010. Since then, there have been some 13 collaborative pilot projects between the two, looking at everything from spinal injury repair to the pathophysiology of multiple sclerosis. Cuello says that this type of collaborative relationship has been garnering attention worldwide since McGill and Oxford signed their formal agreement four years ago. “[McGill’s partnerships with Oxford and ZNZ] are only a few years old, but people in government, academia and industry can see its incredible potential,” he said. “We’ve been approached by institutions from around the world – including Germany, China, Brazil, France, Israel and other places – that are interested in entering into a similar arrangement with us. It used to be the case that the staff of “Oxford university” were a bit touchy about being referred to as “The Universty of Oxford”. The latter was the appellation of a purportedly inferior institution in the same town. @ John Harrod– University of Oxford and Oxford University are the same animal, so no reason why they would have been “touchy” about it–in fact, the official name is “University of Oxford”, so I am afraid your information is completely off the mark.